In Latter-day Saint theology and cosmology, there are three degrees of glory (alternatively, kingdoms of glory) which are the ultimate, eternal dwelling place for nearly all who lived on earth after they are resurrected from the spirit world. Members of The Church of Jesus Christ of Latter-day Saints believe that Paul the Apostle briefly described these degrees of glory in 1 Corinthians 15:40-42, and in 2 Corinthians 12:2. Joseph Smith elaborated on Paul's descriptions based primarily upon a vision he received with Sidney Rigdon in 1832 and recorded in Doctrine and Covenants section 76. According to this vision, all humans will be resurrected and at the Final Judgment will be assigned to one of three degrees of glory, called the celestial kingdom, the terrestrial kingdom, and the telestial kingdom. A small number of individuals who commit the unpardonable sin will not receive a kingdom of glory, but will be banished to outer darkness with Satan where they will be "sons of Perdition". The celestial kingdom is the highest of the three degrees of glory. It is thought by Mormons to be the "third heaven" referred to by the Apostle Paul in the King James Version of 2 Corinthians 12:2 and it is said to correspond to the "celestial bodies" and "glory of the sun" mentioned in 1 Corinthians 15:40–41. The celestial kingdom will be the residence of those who have been righteous, accepted the teachings of Jesus Christ, and made and lived up to all of the required ordinances and covenants. Individuals may accept and receive these ordinances and covenants during their mortal lives. For those who did not have the opportunity while living, they will have the opportunity in the post-mortal spirit world, where they can accept ordinances performed on their behalf by Latter-day Saints in temples. All children who die before the age of eight automatically inherit the celestial kingdom without the reception of ordinances. The celestial kingdom is the permanent residence of God the Father and Jesus Christ. Joseph Smith taught that the celestial kingdom itself is subdivided into three "heavens or degrees". Only those individuals who are sealed in celestial marriage to a spouse will be permitted to enter into the highest degree of celestial kingdom. These individuals will eventually become "exalted" It is believed that this cannot be comprehended in the world; rather, it is said that the learning and understanding of salvation and exaltation will occur even beyond the grave. Like other ordinances, the sealing to a spouse may occur during mortal life or may be accepted by the parties in the afterlife and performed by proxy in a temple. Joseph Smith taught that the earth will also receive a celestial glory. Some Latter-day Saints believe that the earth will become the celestial kingdom. The terrestrial kingdom is the middle of the three degrees of glory. It is believed by Latter-day Saints to correspond to the "bodies terrestrial" and "glory of the moon" mentioned by the Apostle Paul in the King James Version translation of 1 Corinthians 15:40-41 15:40–41. The word "terrestrial" derives from a Latin word meaning "earthly". According to Doctrine and Covenants section 76, those who will inhabit the terrestrial kingdom include those who lived respectably but "were blinded by the craftiness of men" and thus rejected the fullness of the gospel of Jesus Christ when it was presented to them during their mortal lives. It also includes persons who rejected the "testimony of Jesus in the flesh, but afterwards received it" in the spirit world and those who "are not valiant in the testimony of Jesus" after having received it. Joseph Smith taught that translated beings abide in the terrestrial kingdom until they are judged at the Final Judgement, after which they will enter into the celestial kingdom. The telestial kingdom is the lowest of the three degrees of glory. It is believed by Latter-day Saints to correspond to the "glory of the stars" mentioned by the Apostle Paul in the King James Version translation of 1 Corinthians 15:41. There are no known uses of the word "telestial" prior to its use by Joseph Smith. According to the Doctrine and Covenants, those who will inhabit the telestial kingdom include those "who received not the gospel of Christ, nor the testimony of Jesus." It will also include "liars, and sorcerers, and adulterers, and whoremongers, and whosoever loves and makes a lie." Because of their refusal to accept Jesus as their Savior, these individuals will remain in spirit prison for 1000 years during the millennial reign of Christ. After the 1000 years, the individuals will be resurrected and receive an immortal physical body and be assigned to the telestial kingdom. Joseph Smith taught that individuals in the telestial kingdom will be servants of God, but "where God and Christ dwell they cannot come, worlds without end"; however, they will receive the ministration of the Holy Ghost and beings from the terrestrial kingdom. Despite these limitations, in Mormon theology being resident in the telestial kingdom is not an unpleasant experience: "the glory of the telestial ... surpasses all understanding". During the original endowment temple ordinance, members moved between ordinance rooms that represented the three different kingdoms of glory. In most newer LDS temples, the majority of the moves between rooms have been replaced with changes in lighting to represent changes from one degree of glory to the next. 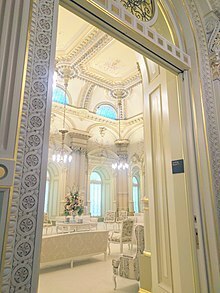 In some of the older Mormon temples (e.g., the Salt Lake, Manti Utah, and Cardston Alberta Temples), the classic version of the endowment ceremony is still done by moving from room to room. 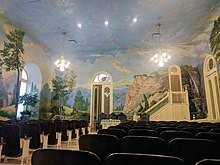 Every LDS temple includes a celestial room—representing the celestial kingdom—that is separate from the other ordinance rooms.